Crossing Boundaries 1: Out from the centre by Chris Bloor. Price £5.95 per copy, including postage and package (UK mainland). Do you run or walk? In the Bristol conurbation, whatever your choice, the countryside is closer than you might think. Chris Bloor's quirky vision of the city uncovers a network of green routes connecting urban centres with the Community Forest Path that girdles the built-up area. If you live in Bristol or one of the connected townships, one of his surreal sketch maps probably depicts a route that passes near your home. How you use that route will depend on whether you prefer a brisk run through the trees in the evening or a stroll from pub to pub along a riverbank. The author gained his knowledge of these routes from twelve years experience of leading runners from The Town and Country Harriers (TACH) through the countryside from a different pub each Thursday evening. 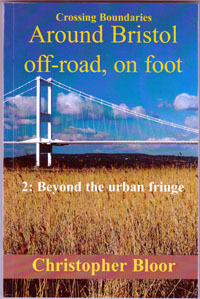 Crossing Boundaries 2: Beyond the urban fringe by Chris Bloor (164 pages). Price £7-50 including postage and package (UK mainland). 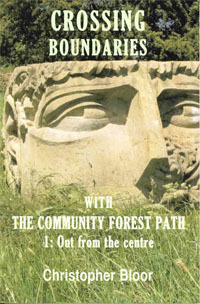 This second book of off-road routes around Bristol explores the countryside beyond the Community Forest Path encircling the city. Building on the ground established in Out from the Centre (above), it adds black and white photographs, more pubs, more quirky maps and snippets of eastern wisdom to enhance the experience of exercise in the open air. with details of your address. Routes around Bristol in a handy PDF format. Index of draft chapters from THE NEXT NEW BOOK, 3: Paths from the other side. Errors and ambiguities in published texts. The owner of this website acknowledges the copyright of all external linked sites. All efforts have been made to ensure the accuracy of information contained herein; the owner regets, but accepts no responsibility for, accidental errors. Website by Martin Wolff, Bristol.